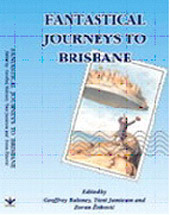 The cicerones of Fantastical Journeys will guide you on sixteen journeys into the unknown. By turns, uncomfortable, unpredictable, weird, adventurous, humorous paradoxical, and frightening, this is an anthology that covers all genres and reaches beyond their boundaries. Inspired by World Fantasy Award winner Zoran Zivkovic’s mosaic novella, Compartments, each writer has crafted their own special tale of a journey to the mythical city of Brisbane. It is a place that only appears on the map of the imagination – a place where suspected terrorists and supernatural beings are incarcerated…where renegade cyborgs and lads from the bush seek salvation... a city awaiting the arrival of the new messiah, while malevolent water-spirits wander the reaches of its river. It is also the place your aunties visit on holidays of transformation and others find their own special road to heaven and hell. Brought to you by the editorial team responsible for The Devil in Brisbane, this is another unique anthology showcasing the wonderful talents of Australian writers of the fantastic. Where is Brisbane and How Many Times Do I Get There?